Hey, guys! Did you know it’s snowing outside, and maybe you should stay off the streets? For the two people living in a cave who hadn’t already heard (and who likely don’t have a television anyway), ABC 7 decided to pre-empt the first round of J! 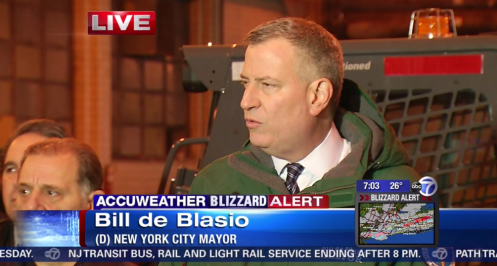 to broadcast a press conference with Mayor Bill de Blasio. We returned to our regularly scheduled program right at the end of the Jeopardy! 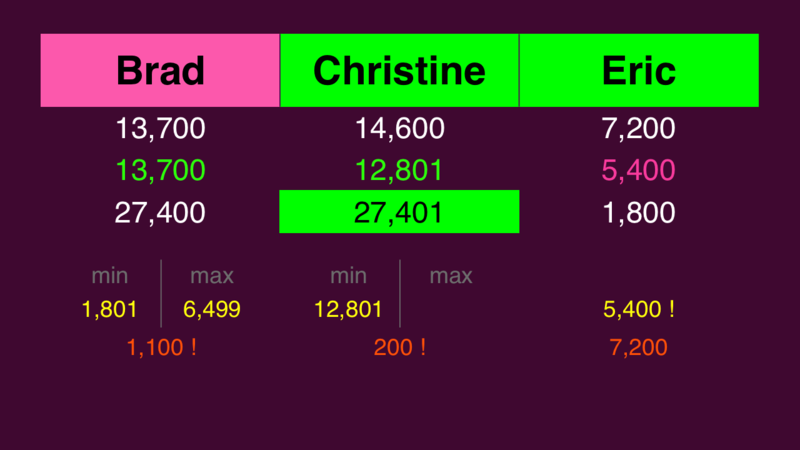 round to find a challenger named Christine in the lead with 10,600. I figured she had wagered big on a Daily Double; a visit to my friend VJ’s recap confirmed that she had, in fact, thrown down 5,000. Brad got the other two Daily Doubles, and wagered very small on both (one right, one wrong). This is a very fascinating situation. Let’s work through it together. If Brad doubles his score, he’ll have 27,400. 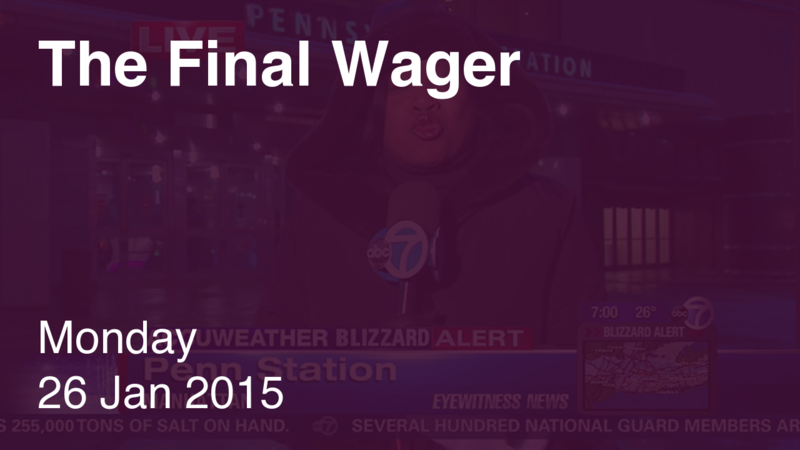 To cover this all-in wager, Christine will need to wager 12,800. An incorrect response with that wager will leave Christine with 1,800. 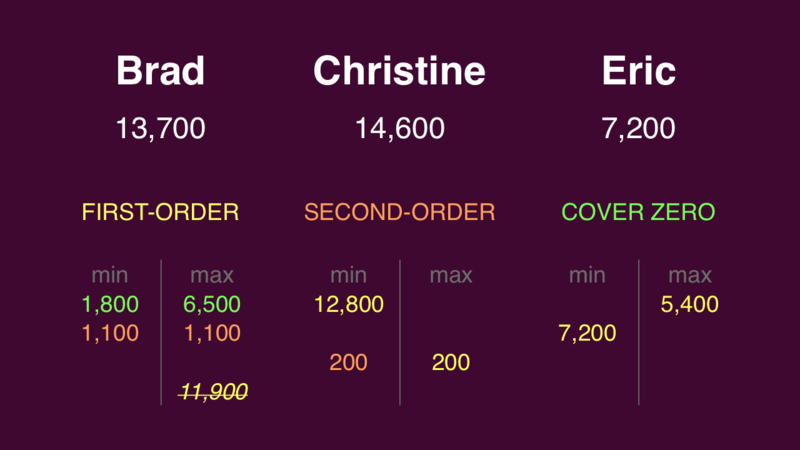 To stay above her total, Brad can wager up to 11,900, and Eric can wager up to 5,400. A successful doubling will put Eric at 14,400. To cover this, Brad should wager at least 700, and Christine could wager at most 200. In response to Brad’s smallish wager, Eric would have to wager at least 5,800, so he might as well go for broke in that case. 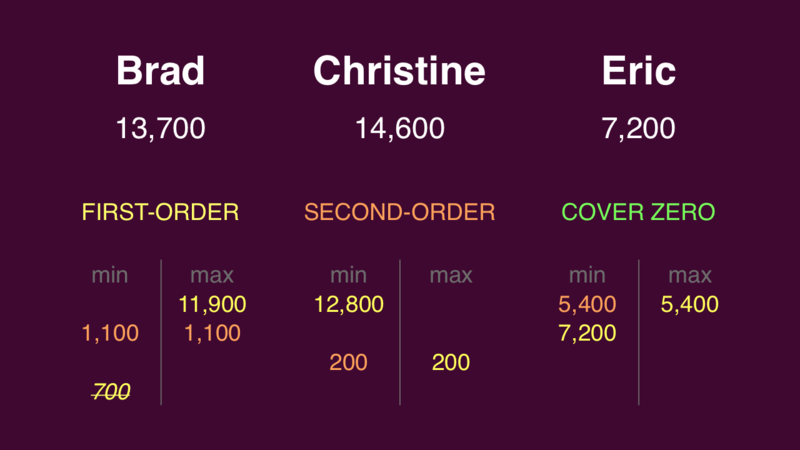 Let’s look at Christine’s smallish wager. To cover that, Brad will have to wager at least 1,100. But if Eric wagers 5,400, Brad would need to cap his wager at 1,100, against which Christine would need to wager at least 200. But she’s already capped at 200 on her small range. Might as well encourage Eric to wager at least 5,400, since a wager-to-tie situation forces everyone to rethink their positions. Brad is the only one who can take advantage of a zero-cover wager. He’ll need to put up 1,800 to cover Christine in case she forces him to respond correctly (at most 900), and no more than 6,500 in case Eric wagers zero. Color me shocked – an absolutely perfect wager out of Eric. Nice work. Brad’s wager had me a bit disappointed. Based on her aggressive Daily Double wager earlier, Christine is almost certainly going for the lock-out. Maybe Brad was really confident in the category and wanted to maximize his winnings if Christine missed; of course, the downside is he will lose if he’s wrong. Or maybe he figured Christine would play for the tie, as a hedge against a 5,400 wager from Eric – and which would have come into play here. But Brad has a legitimate range that would knock Christine out if she’s incorrect, so I’d urge Christine to tack on the extra dollar. In the last 10 regular games (counting tonight) in which we had three players in Final Jeopardy we have the following result: In 2 cases all three got it right = easy. 4 cases of 1 right + 2 cases of 2 right = 6 ok and 2 cases of 0 right = hard. So that’s a “final jeopardy degree of difficulty = just right” score of 60%. The “average degree of difficulty” score (higher is harder) is 1.60. No triple stumper today so the “no triple stumper on FJ” streak now stands at 5 days. I have now been tracking the “just right” percentage for slightly more than a month. Almost all the time it has been in the 40%-70% “butter zone”. There have been a couple of short excursions up to 80%. And the “average degree of difficulty” score is now 1.60, very close to the presumably perfect score of 1.50 (contestants get it right exactly half the time). This indicates to me that the Clue people do a very good job of getting the degree of difficulty just right on FJ clues. So I am going to retire on my laurels. This is my last routine post. It’s been fun. Keith, Eric answered incorrectly by saying LA, therefore his score should be at 2200. Whoops, somehow that got flipped on my slides. Thanks for the catch. Sorry 1,800 I am wrong too.